Jyotishakti & Vidya’s brand NEW album – Alchemy Between Us, released 2018. Featuring popular tracks such as Navadurga (9 Names of Durga), the Gayatri Mantra, Hare Krishna prayer and many more, this beautiful collection of Kirtan and mantra is heart opening, soulful and uplifting. 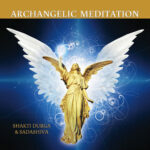 Recorded in Bali and produced by Vishaka, enjoy this devotional album of sweet sacred music and high vibrational energy.